Time for a new workout at ScrapFit. This one is called "Word of the Year"! Show us what you can come up with in one word to describe how you want to embrace the new year. I chose the word Peace. It seems with 3 very active kids life is very chaotic and all I want is some peace! This is a LO of my oldest hanging out at the pond by our house. 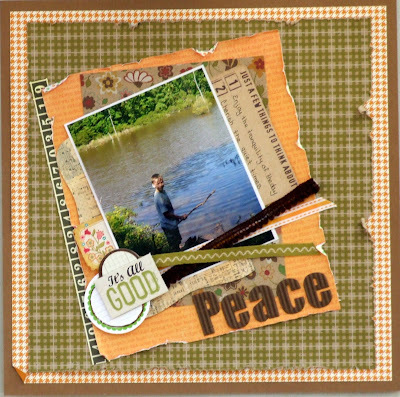 Creat a LO with your one word and link it up to the ScrapFit blog to be eligible for a prize from our sponsor Paper Lovelies. 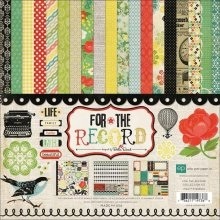 They are giving away the fabulous For the Record kit. Tracy! Thanks for stopping by my blog on the MSW hop today! I love your layout and think your word is a good one..for me too!. Hope to 'see' you around! Ciao! I registered some days ago at MyScraps&More as "scrapaholicgal". Thanks a lot for all your comments, I'm glad that you like my creations!! It's my first time here on your blog and I already had an inspiration with this current workout. Can I create a LO only for this challenge or do I have to link a LO for each workout? And this fantastic prize is for American scrappers only or European ones are allowed too? Desi everyone is eligible for the prize and you can do one or both workouts in a month.